Vintage lovers in search of the perfect purse, meet Enid Collins. 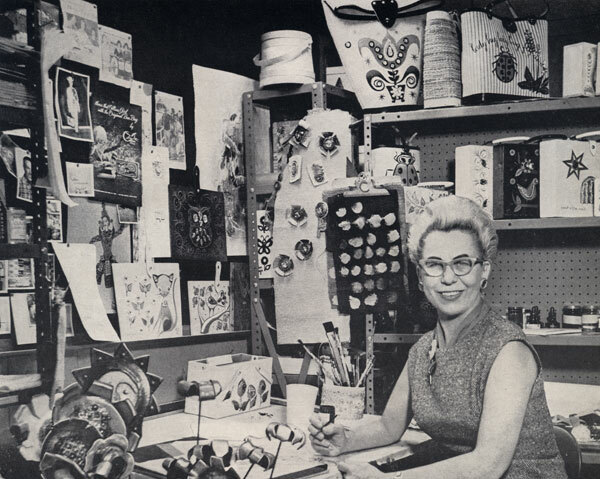 Her family-run bag business was all the rage in the late 1950s through the early 1970s, and her wonderfully whimsical designs are still collected and treasured today. Covered in cuteness, these bags brought art and fashion together in a very fun way, and they’re guaranteed to make you smile. My first Collins bag sighting was several years ago. It was worn by a lovely little old lady on her way to church. Hers was a beautiful box bag bedazzled in pastel flowers, and I imagine she proudly carried it around for decades. I’ve since started collecting them and displaying them around my apartment to admire as artwork, only bringing them out for the most special of occasions. The majority of Collins’ collection featured two styles of purses — canvas, bucket-style totes and wooden box bags. They were each hand-painted, detailed, and decorated in fun themes like the zodiac, owls, cable cars, flowers, and bugs. They also came with leather trim, bright and brilliant rhinestones, interior mirrors, and a cute and clever name. Each bag had its own unique, sparkling personality. Collins and her husband Frederic started making these bags out of their small ranch in Texas. With Enid’s background in fashion design and Frederic’s experience in engineering and sculpting, the pair were able to craft well-designed, high-quality items with entrepreneurial spirit. The bags became so popular that the business outgrew their home and they opened a factory for the Collins of Texas brand. The company was eventually sold to Tandy Leather in 1970. A Collins of Texas bag from my own collection. There are still a lot of Collins collectors out there today, and a great resource to view and share these stunning, statement-making bags is a website run by Collins’ own grandson, Christian. Do you collect the work of any particular vintage designers? I always love running into one of these. They’re magical. Thankfully I’ve never been tempted to buy one – I find the shapes impractical. But they’re amazing to look at. Indeed, they ARE amazing to look at! ; ) I display my box bags on a shelf and use them to hold small things – stationary, pens & pencils, etc. YES! I love Enid Collins (and all of her imitators). Great post! Thank you for introducing this to me, Cindy! This is awesome! I have an Enid Collins bag, and for some reason always thought Enid was male! Obviously I hadn’t looked up the name, and was really delighted to find this post on our site. I use my box bag to hold small makeup, it’s wooden, red, has a roadrunner design on the exterior, and a little mirror on the inside! Will definitely bring mine in so you can see it, Cindy.